It was another busy week with Mr. Ben, but one without much of a theme. Last week was penguins. This week, I had good intentions, but they got pushed aside when we got a bit busy. Instead, we did a little bit of this and a little bit of that, and Ben still got to have a fun week. 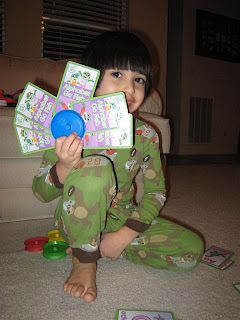 He's on a game kick right now, so we pulled out a lot of our preschool games that are leftover from Miss Faith. 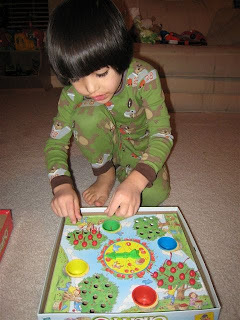 He's interested in playing the math game that came with our Leapfrog Go Fish game, but I'm not sure he is quite there on the independent adding. He is able (thanks to the iPhone) able to do some adding when it's placed in front of him, but being able to take a handful of cards & make equations is a step ahead of what we are currently doing. Ben is a big pirate fan, so "How I Became a Pirate" was a hit with him. The rest of us enjoyed it too. It was very funny and the songs were quite catchy. We don't do a lot of the children's theater productions because they aren't that close to our house, but I'm thinking we need to! We did find an Enchated Learning Pirate sheet that worked pretty well to make a little booklet, but I didn't really search for pirate materials. I'm sure there are tons out there though! Ben has also been on a sounding out letters kick. We've watched Leap Frog Letter Factory more than once (which involved me wandering around the house singing "the B says buh" a lot). We did not, however, do a lot of written work this week. Ben used a couple of his workbooks for a short time (we purchase some simple ones at the Dollar Tree), but he was not in the mood for writing and I was not in the mood to persuade him to do it. Hi! I'm visiting from MBC. Join us in our celebration of followers on Friday Follow!! What app do you use for adding on the iPhone? My little one is really starting to grasp the concept and a game that would help re-enforce would be greatly appreciated! I would also love to know the books for Groundhogs day? I'm thinking about doing a similar theme for next week! I have been trying to write down what we do each day so that I remember too. Then I can post it. I don't remember if I said on your comment about elephants that cracked me up and we have the same problem here with some games. 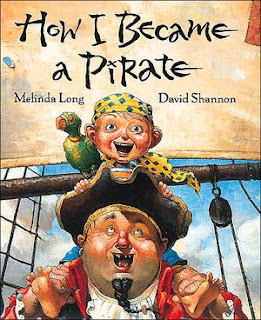 And I love "How I Became a Pirate," have you seen the sequel "Pirates Don't Change Diapers?"